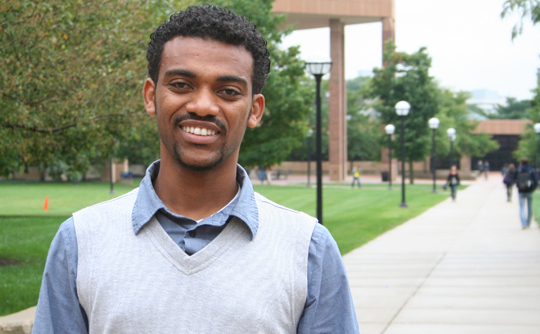 Fikadu Dagefu, PhD student in electrical engineering, was selected to receive a 2011 Lincoln Lab Fellowship. Dagefu’s research interests include devising efficient models for near-ground wave propagation and scattering in complex indoor and urban scenarios. The applications for such models include wireless channel characterization, radar through-wall imaging and distributed sensor networks for environmental sensing. A specific application of interest he modeled and experimentally validated is a source-tracking system for GPS-denied environments utilizing highly miniaturized antennas in the HF range. Dagefu has also been working on a subsurface imaging approach based on distributed near-ground antennas for the detection of deeply submerged targets such as tunnels and Unexploded Ordnance (UXO). This work involves developing an accurate forward scattering model and efficient inversion technique and experimental validation based on laboratory scale model measurements. Before pursuing his PhD, Dagefu received a B.S. degree from the University of Texas at Austin in 2007 and an M.S. degree from the University of Michigan, Ann Arbor in 2009, both in electrical engineering. He conducts his research under the direction of Prof. Kamal Sarabandi. Under the Graduate Fellow Program, MIT Lincoln Laboratory offers fellowships to graduate students in science and engineering at partner institutions. The University of Michigan one of eleven schools eligible for the fellowship. Recipients are in the final stages of their research.